We had so much fun photographing Bev and Craig’s wedding, they were a joy to shoot and their laughter and happiness was deeply infectious! Victoria Warehouse is a cool urban wedding venue in Manchester. It’s industrial vibe, bare brick walls and ironwork were perfect for Bev and Craig's Hacienda club theme. The yellow and black chevrons that are iconic of Manchester’s Hacienda nightclub were featured heavily in the details of their invitations, table names and cake. They even had gig inspired wrist bands in yellow for their guests. Bev and Craig were keen to continue the industrial, urban vibe for their couple shoot so we made the most of the surrounding area, colourful containers, warehouse brick walls and industrial sculptures. We had all the emotions during Bev & Craig’s ceremony! From tears as Bev walked down the aisle to meet a very emotional Craig to the biggest laughs we have seen during a ceremony! 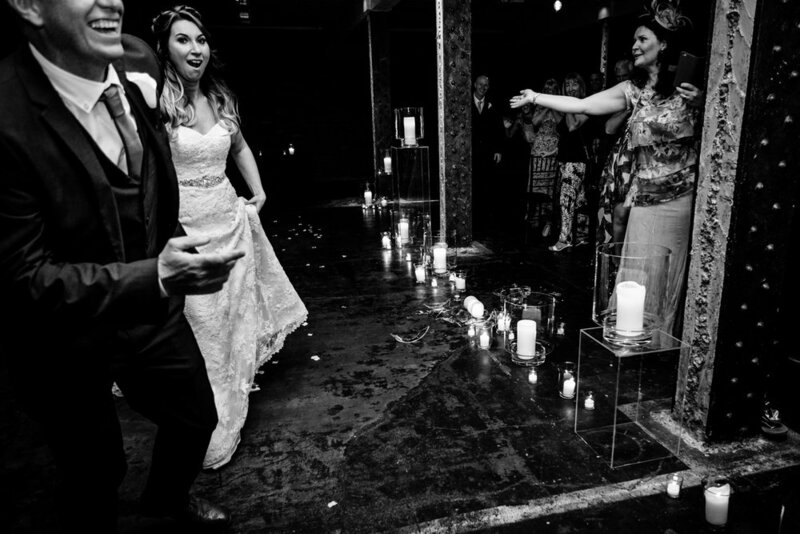 As they walked back up the aisle as Mr and Mrs, Craig’s enthusiastic celebrations caused him to accidently kick over and smash the glass candle jars that lined the aisle. It was pretty spectacular and luckily no one was hurt but it caused roars of laughter! Our approach to your couple shoot is very relaxed, we want your photos to be a true reflection of your personalities so we aim to make you feel at ease and have fun so you can enjoy the shoot and be yourselves. This is one reason we recommend a pre wedding shoot, although nervous at first, Bev & Craig enjoyed their urban pre-wedding shoot in Manchester’s Northern Quarter so much they couldn’t wait to do their couple shoot on their wedding day! We loved that they were up for all our ideas and were inspired to come up with loads of fun ideas themselves, I don’t think we have ever laughed so much on a couple shoot! We love using the urban landscape for cool or graphic shots, but also fun ones too, just see what Tom did with a traffic cone which is Craig’s favourite shot! If you are looking for a photographer for your Victoria Warehouse wedding we would love to hear from you!